While I am at it I will continue with some kid- and baby related matters, strollers. yeayh! All parents get to the point when they ask themselfes what the stroller should do for their family. And so did we. 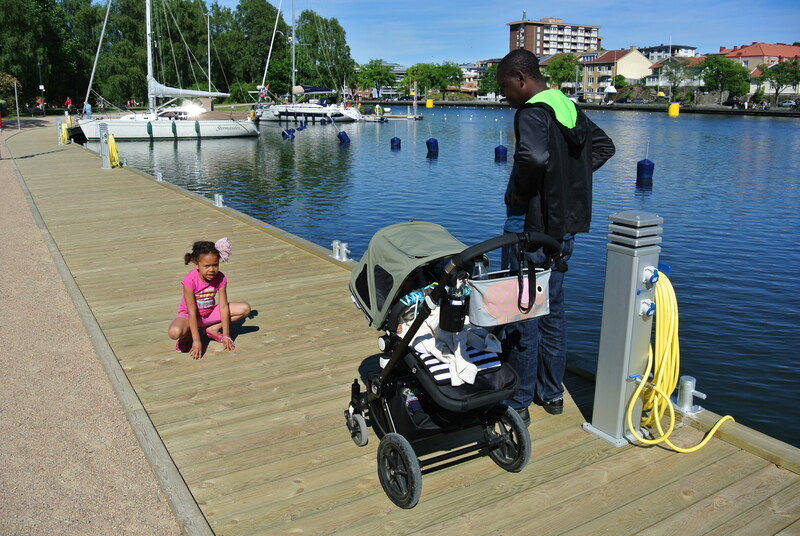 Mr C wanted us to only have one stroller this time and after alot of research we ended up buying a Bugaboo Cameleon. (I am sorry to say though that even if the intention was good I could not stick to just one stroller). We like buying used items so we found one for a really good price that I fixed up a bit. it is a Cameleon plus, not the newest Cameleon 3 model. The Cameleon has almost everything you can wish for in a stroller, it is comfortable for the baby, has a carrycot and an ergonomic seat unit that you can start using as soon as the baby can sit and also it gets small when folded and works in most terrains. It is really easy to manouver for both mum and dad since it has an adjustable handle that has a wide range of positions and the front wheels are swiveling. It also looks really nice and I love that I can change hoods and custom design things for it. Take a look at this etsy shop for inspiration or to order something nice for your Cameleon. 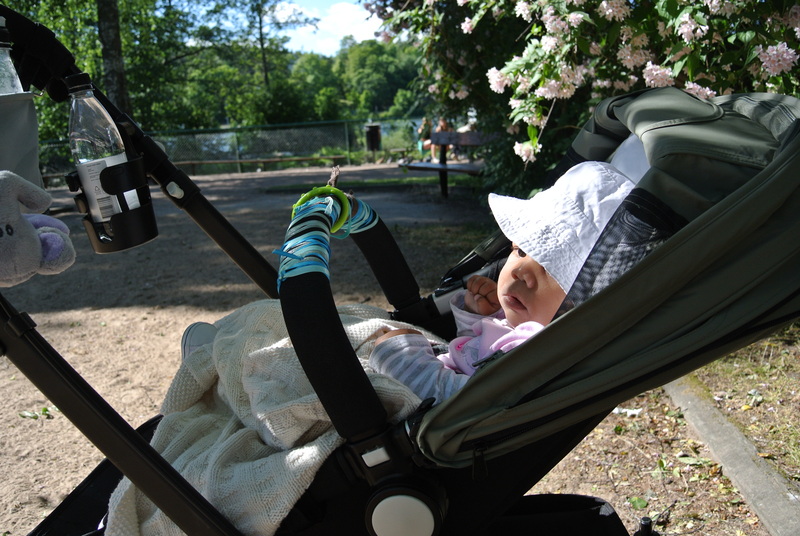 Bugaboo also have all sorts of extras for the stroller, like the breezy canopy and foot muffs in beautiful colours. After all this good things with our Bugaboo you can really wonder why I had to go buy other strollers and it is really a whole other blog post 😉 but I can say that winter and snow is one reason and the foldability is another one. Those are the only negative things I can find with the Cameleon. Since we live in Sweden and we have occasionally alot of snow and even if we have the terrainwheels that you can complement with they make the stroller a bit uneasy to steer. 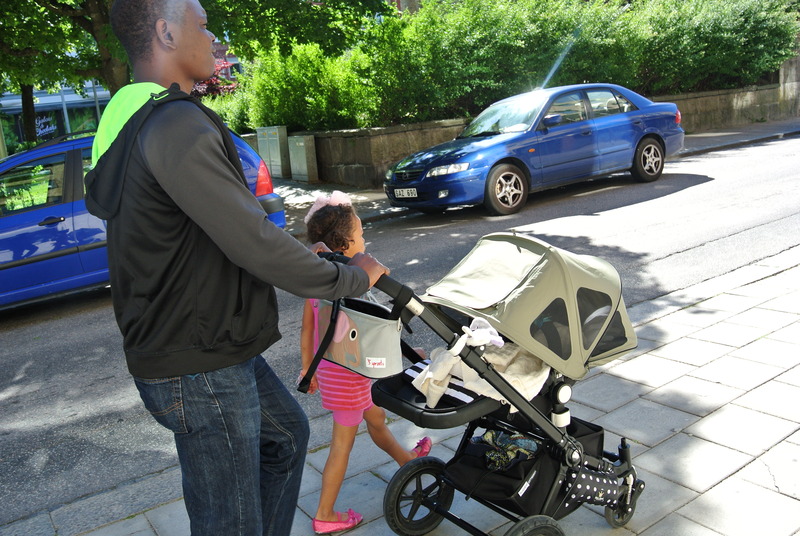 It works but it is not as easy as with an Emmaljunga Edge (which happen to be one of the other strollers I got). The foldability is all about convenience and lazyness. It gets pretty small when folded but it folds in two pieces and it is not either quick or smooth to fold it like that. Th Bugaboo Bee (that also has been here and moved again) has a much easier fold and I wish the Cameleon had the same. Not working with the design though. But we do love our Bugabo Cameleon and even if other competitors are moving in sometimes to be tried and tested I am sure, and Mr S and Baby S seems to agree, that the Cameleon will stay until the stroller period is over. Down you can see how Cameleon is a perfect member of our little family on our summer adventures. Here it has the breezy suncanopy in dark khaki. The organizer is from 3sprouts, the rain cover from Elodie Details, the blanket is hand made in Zimbabwe and bought from Savanna Home and the pram liner is from Outlook.